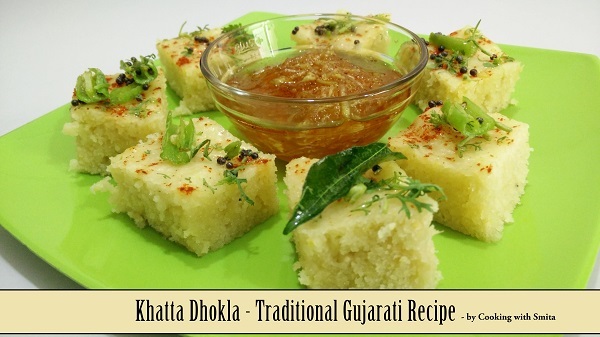 This recipe is about making best soft and spongy Khatta Dhokla in Gujarati traditional way. It requires fermentation of batter to get desired sourness and make it spongy. Rice and Chana Dal (Bengal Gram) or Urad Dal (Split Black Gram) are the main ingredients. Here I will share a recipe made with Rice & Chana dal. Add Dhokla flour in a large bowl, add Buttermilk and mix well to prepare Batter. The Batter should be thick like Idli Batter. Sprinkle some Sugar on the batter. Cover with lid and keep the Batter in a warm place to ferment overnight or 10 – 12 hours. Before preparing Dhoklas, Grease the pan or plates in which you will be making the Dhokla with Oil. Add water in the steam cooker or pan, put the lid on and let the water come to boil. In fermented batter add Ginger & Green Chilli Paste, Salt and 1 tsp Oil. Stir well and pour the batter into greased pan/plates. Place the plates in the cooker, cover the lid with cloth and cook for 10 minutes over medium flame. If cooking in pressure cooker, remove the whistle and cover the lid tightly. After 10 minutes, switch off the gas, do not remove lid for another 2 minutes. Remove plates from cooker and let them cool down to room temperature. For tadka, heat 3 tbsp Oil in tadka pan. In hot oil, crackle mustard seeds, add Green Chillies and Curry Leaves. Spread this tadka on Dhokla. Sprinkle some fresh coriander and serve Khatta Dhokla with Coriander Chutney.